Pilot program empowers global companies with shelf data to uncover in-store opportunities. SAN FRANCISCO--(BUSINESS WIRE)--In a first-of-its-kind pilot program, Advantage Solutions’ digital technology division and Simbe Robotics piloted a program with leading global consumer goods manufacturers to identify on-shelf opportunities and ultimately provide a better shopping experience. Simbe’s Tally, their autonomous shelf-scanning robot, collected real-time shelf data, which Advantage then analyzed and contextualized into actionable data and findings. Simbe deployed Tally over a six-week period in three of Schnucks’ highest trafficked supermarkets. Here, Tally successfully conducted three scans per day over the course of the pilot program. Leveraging Advantage’s deep client relationships, Tally’s computer vision technology captured and analyzed a wide range of data on behalf of three leading global manufacturers. Participating manufacturers received daily reports and a cumulative analysis of macro trends. These reports detailed how their brands could better complement in-store category management and on-shelf opportunities. Reporting encompassed out-of-stocks, trafficked items, low inventories, and pricing audits. Simbe Robotics is the global leader in automation solutions that give retailers unprecedented visibility and insight into the state of their store environments, while improving inventory and mitigating operational challenges. Simbe is a privately held, venture-backed company headquartered in San Francisco, Calif. and works with major worldwide retailers and brands across the US, Europe and Asia. For more information, visit www.simberobotics.com or follow the company at @simberobotics. Tally works in concert with retail store associates by empowering them with timely information to ensure products are always stocked, in the right place and correctly priced. 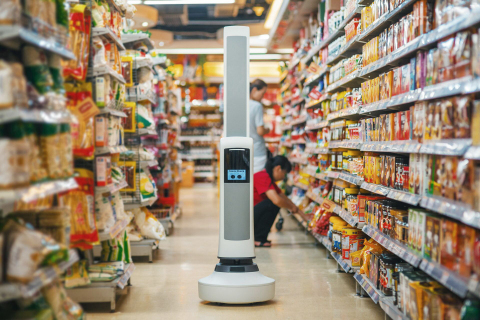 Using a suite of sensors, the robot operates safely during normal store hours alongside shoppers and employees and doesn't require any infrastructure changes to the store. Tally's design is intuitive, friendly, and fits naturally into the retail environment. The robot typically scans stores three times per day and autonomously docks, allowing for continuous operation. Combined with Simbe's cloud-powered software platform, powered by computer vision and machine learning, retailers have unprecedented information and insight into the state of their stores. This information can be used to streamline store performance, maximize customer satisfaction, increase sales, and optimize operational expenditures. Advantage is a leading business solutions provider committed to driving growth through winning insights and execution. Advantage's customizable and technology-enabled sales and marketing solutions -- including headquarter sales, retail merchandising, business intelligence, and a full suite of marketing services -- are designed to help manufacturers and retailers across a broad range of channels drive consumer demand, increase sales, and achieve operating efficiencies. Headquartered in Irvine, Calif., Advantage has offices throughout the United States and Canada and maintains a platform in select markets throughout Africa, Asia, Australia, and Europe through which it can service global needs of multi-national manufacturers. For more information, please visit www.advantagesolutions.net.